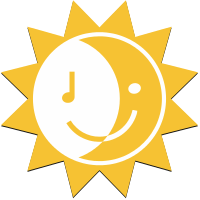 Sunrise is a music program for ages 2-4 and part of the Music for Young Children program. In the program, students enjoy all of the traditional music sing along class elements like singing, dancing, and rhythm instruments with an additional focus on developing musical vocabulary. Sunrise is a fun way to discover musical concepts and develop musical preparedness – it’s a kickstart for the MYC Sunshine keyboard classroom. Classes are 45 minutes long and run for a 10 week session. A new curriculum is designed for each season. Activities include singing, dancing, listening, rhymes, clapback, singback, tonal and rhythm patterns, music vocabulary, stories, puppets, and crafts. The class includes a Student Manual, CD, puppet and rhythm instrument to encourage musical practice at home. You can download the registration from here.